I am currently working with a Doughboy authorized dealer to install a pool. The problem is Doughboy is really proud of there pools and I can't see paying 10,000 dollars for an above ground pool when there are so many other alternatives online. I realize they do make a quality product but I am on a budget! They are willing to install but they are not really sure about cutting the straps off of the pool I am currently looking at. So I was wondering are there any other pools they maybe I could convince them to use for the install. Any help is well appreciated! Hi Jason. Any installer that has worked with the Doughboy oval pool system should be able to modify any pool with straps. It is a simple matter of copying the Doughboy system. You install an L bracket under the channel, you use 8" x 8" x 16" blocks under the channel, and behind the channel and you make sure your side to side spacing is perfect. It can easily be done. The results of a deep area in a non Doughboy pool are hit and miss. Doughboy has the best expandable liners on the market, they always have. Done correctly, they can be installed wrinkle free every time. I know of no other brand that I could say that about. My advice would be, if you want the deep area, go Doughboy. It is well worth the extra money. The alternative would be getting one of the many pools with a 52" or 54" wall and keeping it flat bottom. 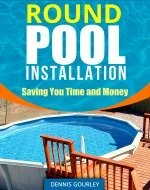 Another option would be getting a cheaper oval pool, doing the modification, and installing a Doughboy expandable liner into it. After going through every option and reading more on your site, I determined doughboy was the way to go for many reasons! One, the deep end would be a true 7 to 7 1/2 feet deep! The equipment comes with a great warranty and I was able to get a few extras from the dealer! Your comments and articles made this decision a whole lot easier and really clarified the quality that doughboy excels in! Thanks for your time and knowledge! Well appreciated!